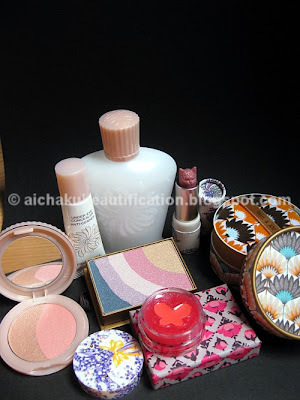 This article was originally posted at http://aichakubeautification.blogspot.com. If you see it anywhere else without credit, the content is stolen without permission. While I was pretty disciplined and avoided hauling too much during the Great Singapore Sale in June and July this year, I caved-in to temptation more than a few times recently, lured by alot of nice shopping deals for the newer Summer and Fall collections. Among these recent temptations was the Isetan Sale where Paul and Joe items were going at 20% off. There were also some good packaged sets from Paul and Joe to be had at a nice price. It's been some time since I last bought Paul and Joe, and I didn't get to any of the latest warehouse sales, so I took the opportunity to get some items I'd been thinking of buying but held off when they were first released. 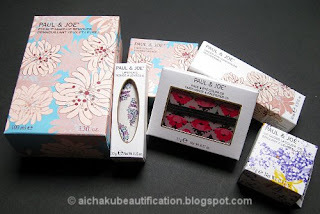 I really adore the Paul and Joe packaging. Such nice patterns on the boxes! Here's a look at the colours and items inside the boxes. I've been wanting the Limited Edition Oil Control powder from the Sahara Summer 2010 collection, so I picked one up. I needed a concealor so I got one from Paul and Joe. And also got a lip gloss because of the cute butterfly shape in the pot. The gloss is very soft and not too sticky, which is the way I like my glosses. I've been on a blush binge lately, and got one more blush at Paul & Joe. The rest are a bundle purchased at a nice discount: a makeup remover and some makeup items from the Fall 2010 collection. While I was at the counter, I remembered to pick up my Paul and Joe member gift. The member gift is something you can redeem after collecting a certain number of points. I'm not sure I like the nail colour but I was glad to have this rather than the previous set which contained some skincare. I can't take Paul & Joe skincare, sorry to say. I'm looking forward to using all these pretty products. There's something special about Paul & Joe products, eh? I would love to get what you got but it would break my wallet - lol! Lovely haul!!!! I got the same deal as u on the Claire de Lune items. Great haul! especially love the look of the nail polish! visit me at my crafty blog! Young Living is the essential oils brand I use and trust. I've used essential oils for decades but Young Living is the BEST I've experienced. You may go to my Young Living facebook album where I've gathered many infographics, to learn more about the brand, the many uses for essential oils and how to sign up as a member to obtain great distributor prices and freebies. Or you can leave a comment in my posts or contact me by email if you prefer.